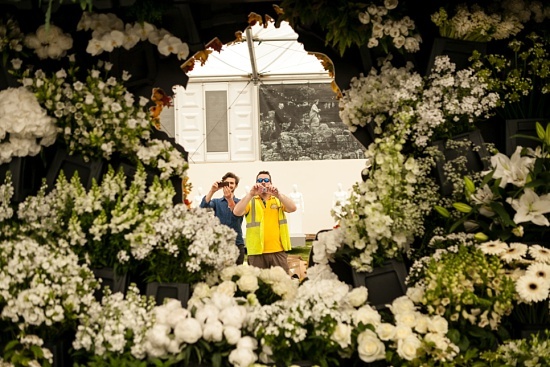 Six months of planning, 35 specialists and 10,000 stems all lead to this; our RHS Chelsea Flower Show debut, titled Behind Every Great Florist. 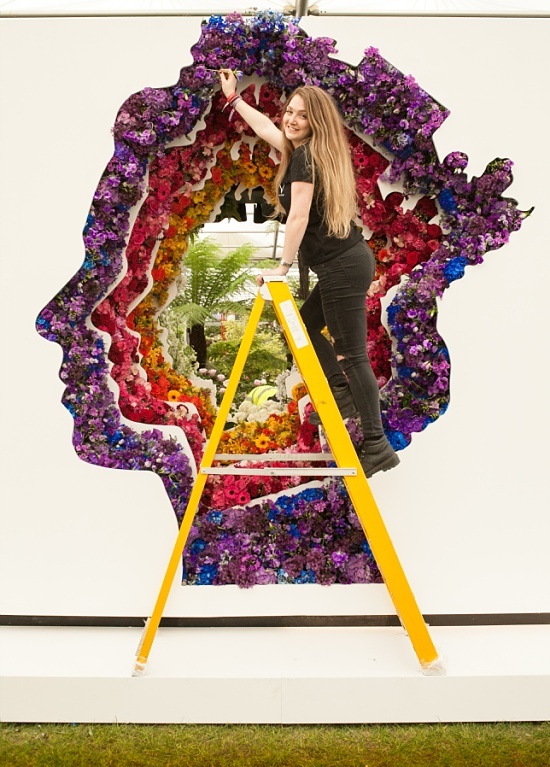 Our debut exhibit is a 360° floral art installation that brings to life the deep-seated bond between the Flower Market and our customers, the talented independent florists who flower London every day. It's the story of two sides intrinsically bound together. 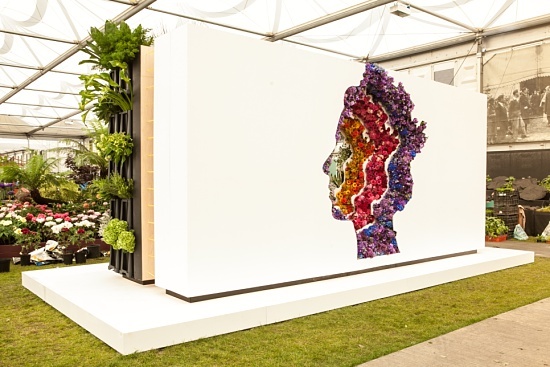 A show-stopping floral tribute to HM the Queen on her 90th birthday, the exhibit is designed by Veevers Carter, one of London's most innovative floral design and event styling companies, and one of our most devoted customers. 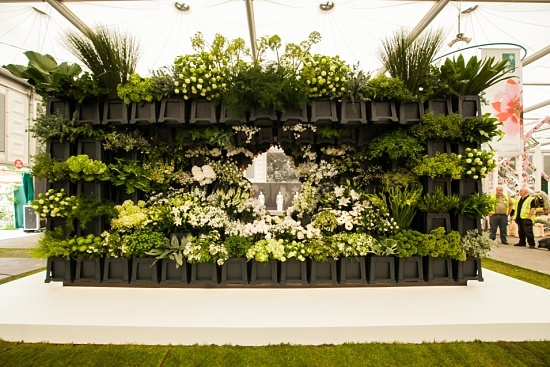 A three metre high wall of black flower buckets, iconic symbols of the Flower Market, overflowing with flowers and foliage from around the world in a refined palette of green and white, represents the bustling and vibrant trading environment of the Flower Market. This is where the industrial environment of the market contrasts with the natural beauty of the product. The uniformity of the rows breaks down toward the middle, as the buckets and flowers are pulled into the centre, travelling through a core that depicts the designers' creative thought space. The two sides of the story are bound together by a stream of yellow ribbons, a physical representation of the close relationship, both professional and personal, between the market and London's independent florists. The ties that bind the two are so powerful they hold each other up, sharing the highs, as well as the lows, of flowering London. Erupting spectacularly from the centre in a riot of colour is a work of modern sculptural floral art. 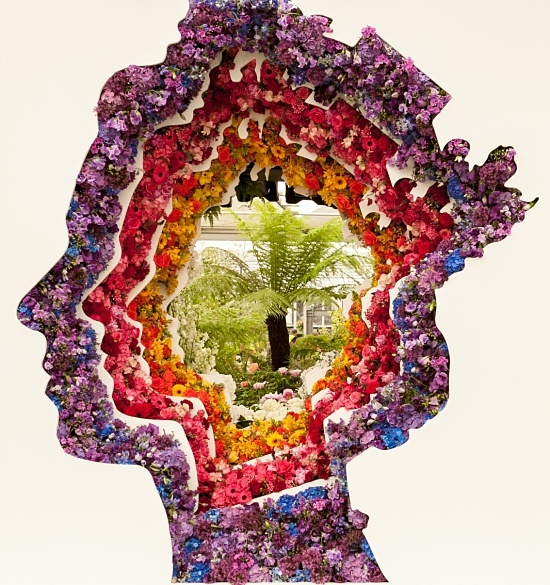 The iconic Queen's head re-imagined as a layered, scented tapestry of flowers set against a white backdrop. A floral tribute to Her Majesty the Queen on her 90th birthday, this represents the exquisite craft and creativity of London's great florists. 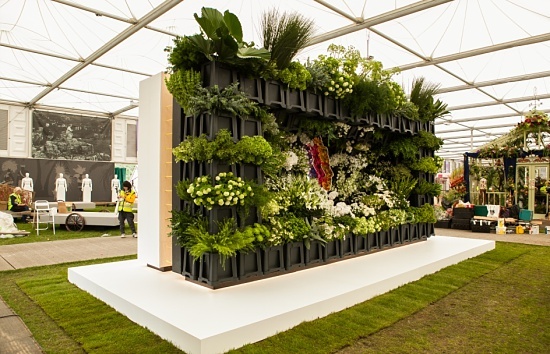 Did you know we've been quietly supplying the cut flowers, foliage, plants and floral sundries for award-winning show gardens and exhibits for decades? Our flower and foliage wholesalers source from growers and exporters across the globe. In our exhibit, the world's best flowers come to the world's best flower show, via New Covent Garden Flower Market, of course. 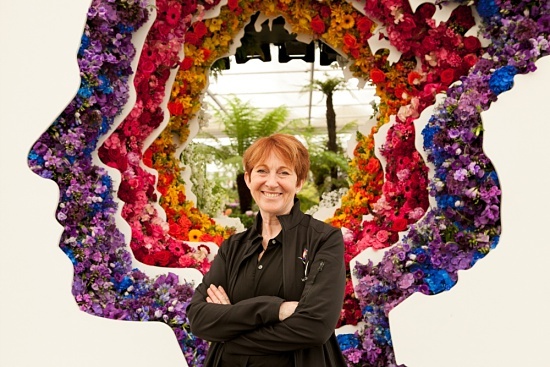 We entrusted the design of our debut RHS Chelsea Flower Show exhibit to Ming Veevers Carter, Creative Director of Veevers Carter, florist, event company and one of our most devoted customers. 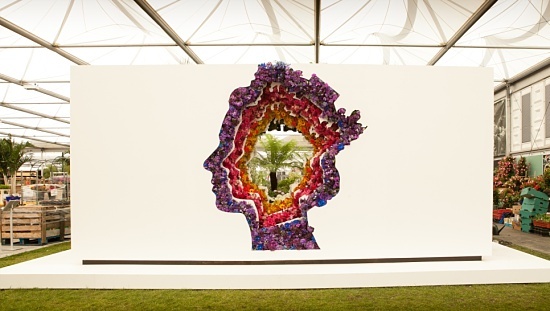 Spectacularly conceptualised by Ming and her team, this sculptural landmark display has been produced in conjunction with Event Concept, the sister event design and production company of Veevers Carter, whose joint creative team of set designers, landscape and interior architects, florists, production designers and engineers have worked closely to realise a Chelsea design of staggering complexity.